A belated Happy National Ice Cream Day! Actually, July is Ice Cream Month, so I’m not late yet! Whew! We’re in the middle of a heat wave here in North Carolina, also known as summer. 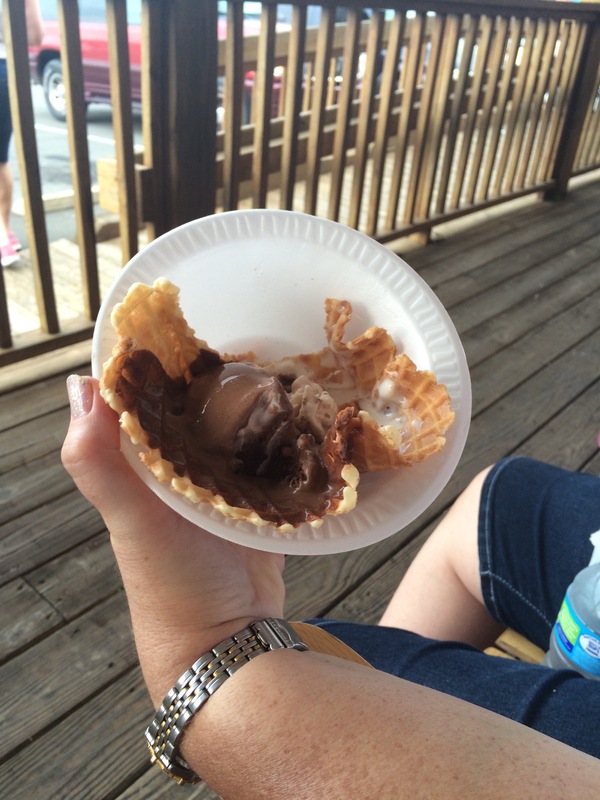 But when my friend Lori invited me to an ice cream celebration at a dairy farm in Hillsborough, I couldn’t say no. Standing outside in the heat and humidity is much more bearable when there’s ice cream involved. A dairy farm is not a bakery, so I suppose technically this shouldn’t count for my NC bakery tour, but it’s still dessert, so I’m counting it anyway. 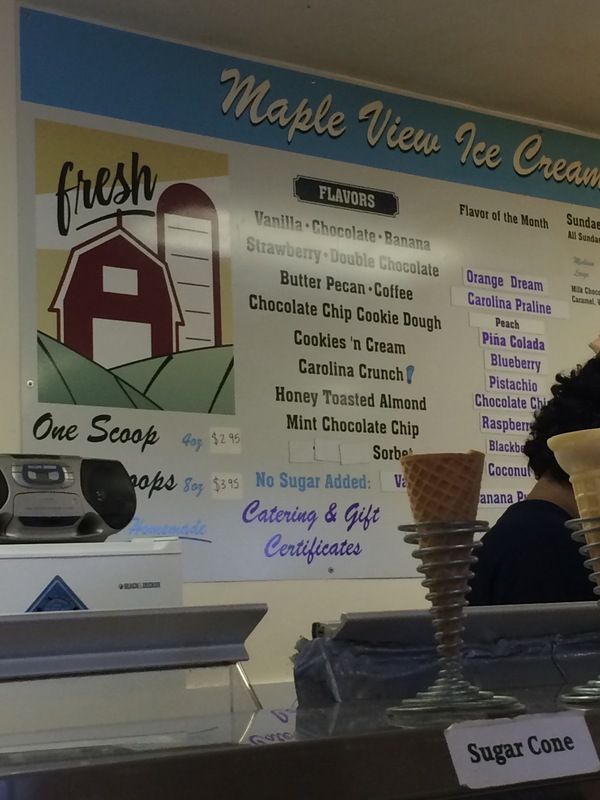 Although they do make waffle cones and bowls. Loophole? Anyway, I don’t normally get more than a single scoop in a cup or sugar cone (NEVER a cake cone. Yuck. 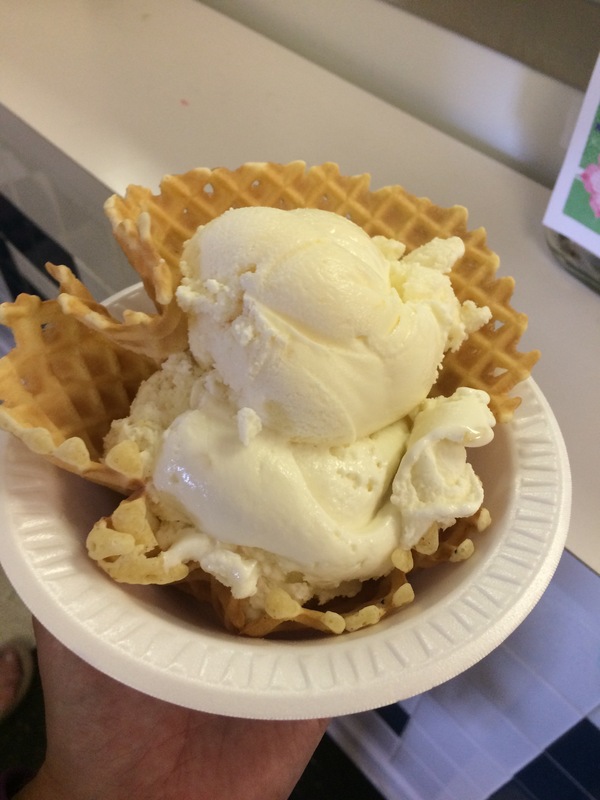 ), but in the spirit of adventure and research, I splurged on a two scoop waffle bowl. Oh, and also because WAFFLE BOWL. Unfortunately, you can’t see the difference between the two flavors I got. I decided to switch it up from what I would normally get. Again – spirit and adventure. I spotted Honey Almond sitting right below my favorite Butter Pecan, and decided that sounded delicious. When I finally got up to the counter, I asked the girl taking my order which flavor would play well with the Honey Almond, since I couldn’t decide. She told me that most people go with one of the fruit flavors, so I chose peach. For the purposes of a photo, Lori’s choices were much better. She got chocolate and a flavor called Carolina Crunch, which is vanilla ice cream with different kinds of candy bars mixed in. The third member of our group, Julianna, stuck by her favorite flavors of cookie dough and coffee. Lori was slightly disappointed by the Carolina Crunch and wished she’d gone with another chocolate flavor, but the rest of us were thrilled! 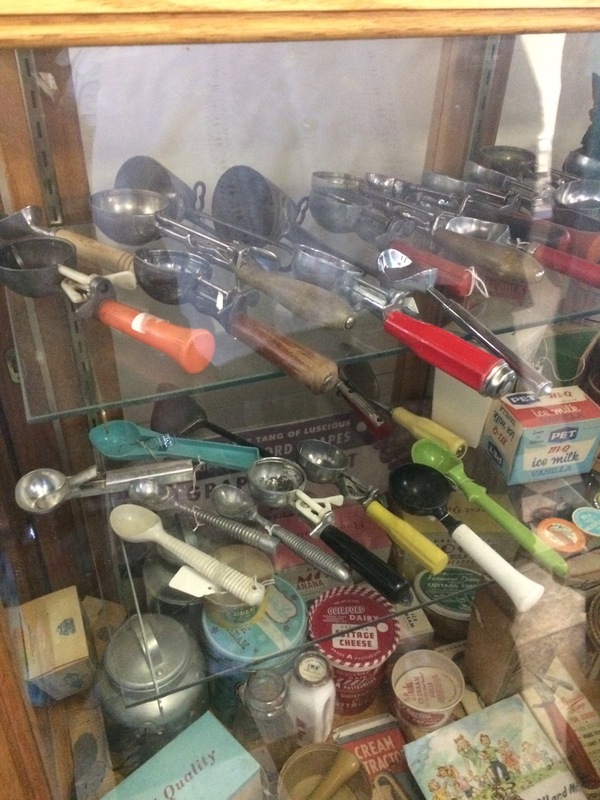 I loved their collection of ice cream scoopers! Totally retro, and the decor outside matched! We managed to snag three seats on old-fashioned wooden rocking chairs on the porch outside the store, and ate our ice cream while watching a southern summer thunderstorm. The large number of other people around killed the atmosphere a little, but the whole experience hearkened back to a simpler time. I wondered if I’d actually be able to taste the honey in the honey almond flavor, but I wasn’t disappointed! It came through perfectly, and the almonds were a nice textural element. I was also happy with my second choice of peach. It was smooth and creamy, without having an overwhelmingly fruity flavor. It also didn’t have huge chunks of peach in it, which I loved. In case you’re wondering, the girl behind the counter gave me the right advice on pairing a fruit flavor with the honey almond! Beyond that, I think that I made the right choice in peach because it complemented the honey without overwhelming it. I think blackberry (my second choice) might have been too much. Since we were at a dairy farm, there were options besides ice cream, and I couldn’t resist the quart of chocolate milk in a glass bottle. 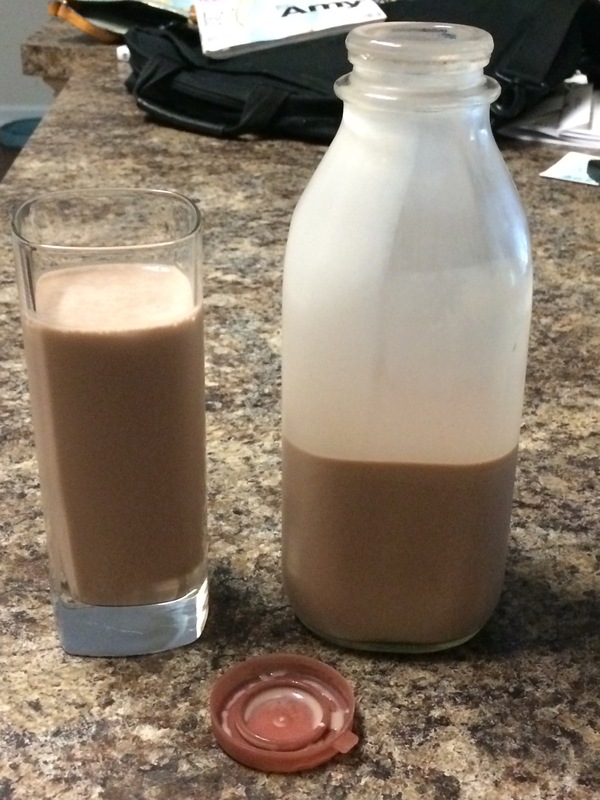 Husband has recently been creating his own chocolate milk out of the skim milk and chocolate syrup we keep in the fridge on a regular basis, so I gave him the task of comparing this to his usual creation. His response was that the Maple View milk had a better consistency since the chocolate was mixed in well (better than what he could do with a spoon, obviously), but he would prefer if it were something other than whole milk. Can’t please everyone, I guess! I’m excited to go back to Maple View Farm this summer! Next stop on the bakery tour – Winston-Salem. Where should I go? I went to UNC, but now I live on the west coast. I miss Maple View! !